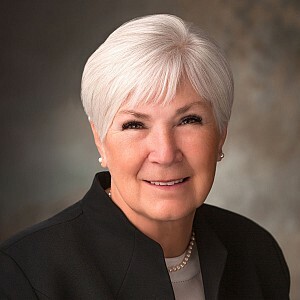 Gail Miller is owner of the Larry H. Miller Group of Companies and Chair of the Board of Directors of Larry H. Miller Management Corporation. Gail and her late husband, Larry, started their business with a single Toyota dealership in 1979. The Larry H. Miller Group of Companies has grown to include more than 60 car dealerships throughout the West, the Utah Jazz, the Salt Lake City Stars, the Salt Lake Bees, media outlets, theatre complexes, sports apparel stores, and a variety of other automotive, financial, sports, and real estate companies. Today, the privately-owned Larry H. Miller Group of Companies employs nearly 11,000 people. Gail and Larry created a strong legacy of giving back to the communities in which they do business. Gail presides over the Larry H. Miller Education Foundation, Larry H. Miller Charities, and the Larry H. & Gail Miller Family Foundation, which support a wide range of charitable, educational, and humanitarian causes. Gail gives freely of her time and is actively involved in many other business, civic, and educational endeavors. She serves on the National Advisory Council at the University of Utah and the President’s Leadership Council at Brigham Young University. Gail also serves on the Shelter the Homeless Board and the Board of Trustees of Intermountain Healthcare and the Board of Directors of Zions Bank. Gail has been recognized with many public honors, including Doctor of Humane Letters from the University of Utah and Salt Lake Community College, an honorary Doctor of Humanities from Weber State University, and the Salt Lake Chamber’s highest award “A Giant in Our City.” She is also the recipient of the internationally-recognized ATHENA Award. In 2012, Gail married Kim Wilson. Kim recently retired as a senior attorney with one of Salt Lake City’s oldest law firms, Snow, Christensen and Martineau, which has been in business since a decade before statehood was granted to Utah. He is Chair of the Board of Trustees of Mormon Historic Sites Foundation and serves on the boards of a number of other civic organizations and causes. Gail and Kim enjoy traveling, serving others, and spending time with their large family. They make their home in Salt Lake City, Utah.